As Roman Weidenfeller bids a final Auf Wiedersehen to Borussia Dortmund, bundesliga.com takes a look at six bona fide BVB icons whose reputations have been carved out in black and yellow. Ball boy to Bundesliga winner sounds like a fairy tale, but it is the reality of one of the classiest midfielders ever to wear the black-and-yellow shirt. After Sahin announced he would be ending his association with BVB to join Werder Bremen in the summer, he posted a Twitter video detailing what was a spectacular journey across a decade-and-a-half and 274 competitive appearances in two spells at the Signal Iduna Park. After a loan move to Feyenoord for the 2007/08 campaign, he played 88 Bundesliga matches either side of a two-year hiatus with Real Madrid and Liverpool, two of the planet's biggest clubs, who had been convinced to sign Sahin after he had majestically orchestrated the 2010/11 title win, providing the inspiration to complement Sebastian Kehl's industry. "For all but two games this season I'll be a Dortmund fan," said Sahin, whose Bundesliga bow on 6 August 2005 at the age of 16 years and 335 days means he still is the youngest-ever top-flight debutant in Germany. "Until my last breath, when I close my eyes, I will hear you singing my name." When Kohler arrived in Dortmund aged nearly 30 in 1995, he knew the club, and EVERYONE in football knew him. A two-year spell at Bayern Munich had been followed by a five-season stint at Juventus while he had been one of the rocks on which Germany's 1990 FIFA World Cup triumph had been founded. With age against him, few could have expected Kohler would give a magnificent seven more years to Dortmund fans who gave him the 'Fußballgott' (Football god) tag supporters would later adopt for Bastian Schweinsteiger. "What stayed with me is the warmth and humanity these people showed me," said Kohler, whose none-shall-pass approach to defending was the cornerstone of Dortmund's UEFA Champions League win over his former club Juve in 1996/97. "You can't buy that with all the money in the world." He was free. Yes, Dortmund's legendary goalkeeper did not cost them a single cent. 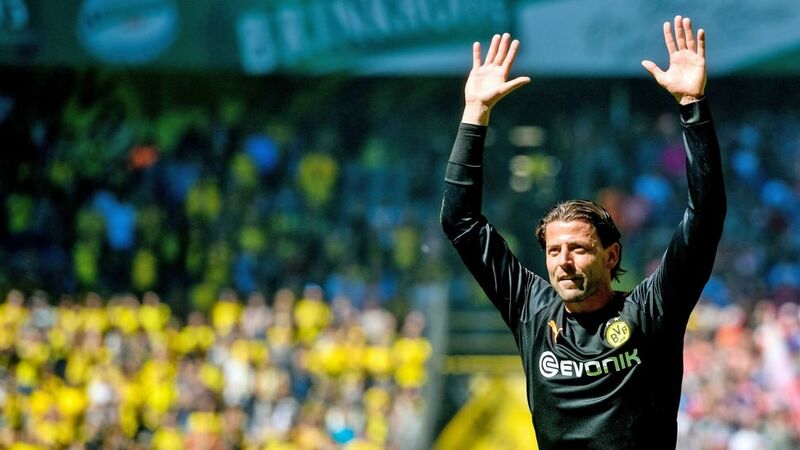 Quite a return for BVB, who picked up Weidenfeller as understudy to Jens Lehmann from Kaiserslautern in 2002 and then saw him make 349 Bundesliga appearances, second only on the club's all-time list to Zorc. There was a silverware lining to go with those games, notably the Klopp-inspired titles, two DFB Cups and — as a result of his consistency for his club — a late career Germany call-up that was soon followed by an unlikely 2014 World Cup winner's medal.